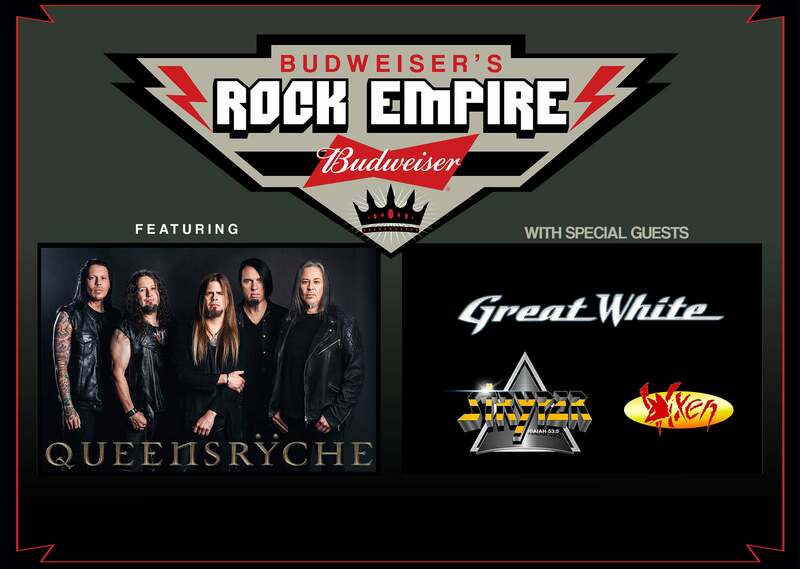 Budweiser’s Rock Empire comes to the Austin area this fall featuring Queensrÿche with Great White, Stryper and Vixen on Saturday, September 28th at H-E-B Center at Cedar Park. QUEENSRŸCHE secured a triumphant legacy as one of hard rock’s most respected and celebrated acts, selling 30 million albums around the world across a 30-plus-year career. The band’s name is uttered in the same breath as many of the groups they looked to as influences and others who arose as peers. Queensrÿche built a dedicated legion of fans traveling the globe on tour with fellow rock giants like Iron Maiden, Guns N’ Roses, Metallica, Judas Priest, and Def Leppard. In recent years, they’ve consistently delivered high octane live shows combining the hungry fire of a new band with the tempered experience of master showmen. Even with eleven gold and platinum plaques and a several Top 10 hard rock anthems woven into the very fiber of the genre, Queensrÿche won’t relent. In fact, they’re in the throes of a jaw-dropping creative resurgence. For the first time in its 36-year history, Grammy nominated hard rock band legends, GREAT WHITE takes on its third frontman, Mitch Malloy. With a respectful nod to the past forging its tried-and-true mantra: these songs are bigger than any one member. That arsenal of songs include the Grammy nominated Best Hard Rock Performance hit, “Once Bitten, Twice Shy,” Great White has sold over 10 million albums worldwide, has six Top 100 Billboard hits, nine Top 200 Billboard albums, two platinum albums, and clocked the top of MTV four times. VIXEN, founded in St. Paul, MN by high-schooler guitarist Jan Kuehnemund, prides themselves as the only female hard rock back from the 80’s who sold over a million albums, had six #1 videos on MTV and had four songs in the Billboard’s Top 100.